We're counting down: 8 days to the PATH International Conference kick-off! The General Session at this year's conference on Friday, November 11, will be a Disabilities Panel. The panelists are professionals and experts in their respective fields. However, they may not be individuals who are familiar with equine-assisted activities and therapies (EAAT). Advance questions from attendees will help them prepare for the panel. Questions may be general or about a specific participant with a specific need. The forum moderator will also welcome on-site questions, but advance preparation will help the panelists anticipate the types of questions they are likely to be asked. This open-forum discussion should prove to be informative and interactive, and we are glad to have the opportunity to offer it to you. 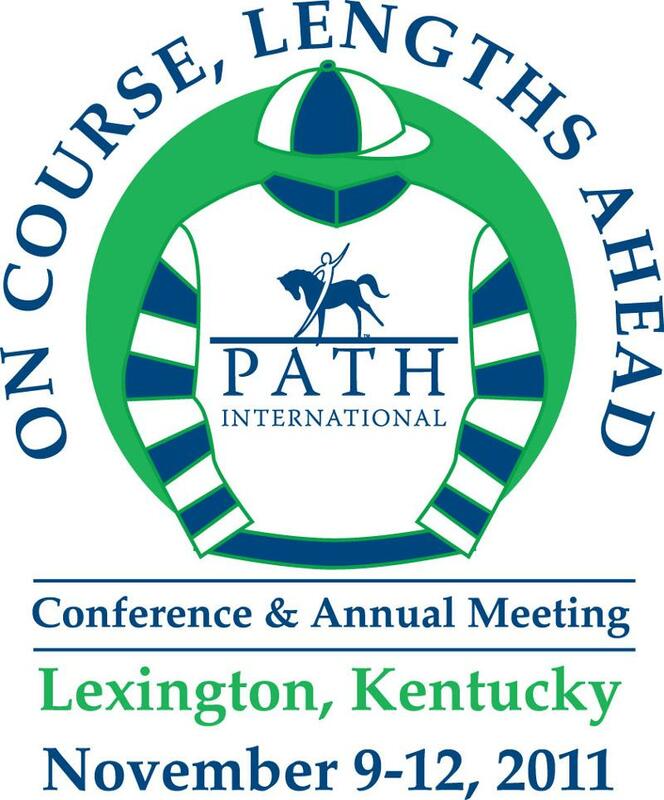 We are all looking forward to this year's Conference and Annual Meeting in Lexington, KY. The success of this event depends on many volunteers doing a variety of tasks throughout the conference. We need people willing to volunteer in shifts of two or four hours (more if possible) throughout the week. Merchandise Booth set-up, Tuesday, 12-2 p.m.
Room Monitors Thursday: "Fund Raising at Horse Show Time"; "Insurance/Risk Management"; "Leveraging On-Line Channels"; "Fundraising 101"; "Solving the Puzzle"; "Building a Solid Grant Proposal"; "Research"; "Effect of EFP on PTSD in Youth"
Room Monitors Friday: "On Course to Compete"; "Morning Glory No More"; "Disaster Awareness"; "Veterans, Horses & PTSD"
Speaker Assistant: Saturday, "Using Driving to Support Motor Vehicle Skills"
Breakfast Ticket Takers: Friday, 6:45-7:30 a.m. Send the form back by e-mail as soon as possible to Pat Kline or fax it to her attention at (859) 252-5016. If you have any questions or concerns, please call Pat at (859) 231-7066. Note: Room monitors must be conference registrants and will be asked to show their wristbands at volunteer check-in. The Equine Land Conservation Resource (ELCR) has named the late Marjorie V. Kittredge of Massachusetts as recipient of the Anson W. Taylor, Jr. Award for Leadership in Equine Land Conservation. Marjorie, who helped found PATH Intl. 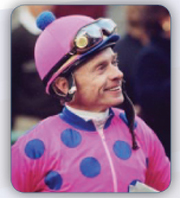 (then NARHA), died in 2010. The award, being awarded posthumously, was presented to Marjorie's son Charlie Kittredge and daughters Lucinda Sullivan and Ellen Scott by ELCR CEO Deb Balliet and ELCR Advisory Council member Susanna Colloredo-Mansfeld during a special ceremony during the General Assembly of the Massachusetts Special Olympics Fall Tournament, Equestrian Finals, on October 15 at Kittredge's Windrush Farm in Boxford, MA. Watch the video here (thank you to Lisa Derby Oden of Blue Ribbon Consulting). The 2011 PATH Intl. Conference and Annual Meeting marks the first time the Marjorie V. Kittredge Equine-Facilitated Psychotherapy and Learning Scholarship has been awarded. It is for the person who is an EFP/L professional or studying to be one. The Equine Land Conservation Resource is the only national not-for-profit organization advancing the conservation of land for horse-related activity. The following explains a bit about enrichment and directions to create a cheap and reusable feeder that encourages foraging behavior. Enrichment techniques are widely used in zoos, aquariums, research and teaching facilities to encourage more typical behaviors and discourage atypical behaviors. Some behaviors (like cribbing and weaving) shown by domesticated horses are atypical to their species and signs of stressors in coping with their environments (FASS, 2010). Incorporating enrichment for horses may also alleviate these behaviors and environmental stressors in programs. I encourage you to look more into enrichment and atypical behaviors before incorporating enrichment techniques with your horses. Cut holes in the clean plastic jug (larger in size for larger pieces of food and smaller for smaller). If desired, hang the container. When hanging, the container swings and creates a different challenge than when placed on the ground or in a feed bunk. I have used plastic orange juice containers and strung twine through the lid. Fill the container with the chosen food and present it to the horse. When knocked, food falls out, which encourages foraging behavior. This feeder can be used in stalls, turn-out areas or elsewhere, and it can be hung over a rubber mat or feed trough if there is a concern about horses eating off the ground. Use a break-away rope and hang the feeder high enough so horses don't get tangled in the rope. Also, document behaviors shown, levels of engagement of the horse, changes in behaviors (atypical and/or typical), and any other safety concerns your program may have. Enrichment techniques implemented strategically can serve as part of the program and may overcome symptoms associated with mental, physical and emotional burnout for horses and personnel. The Equine Welfare Committee encourages positive and engaging educational exploration from our readers. We'd love to hear your feedback! Please let us know if you have any questions about our tip or have a suggestion about specific topics you would be interested in learning more about in the future. Email Kristin Mason, EWC chair. Thank you! 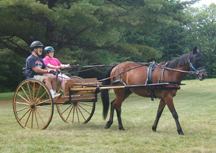 Equine Journeys in Bridgton, Maine, seeks other centers from across the country to help petition the International Special Olympics Committee in Washington, D.C., to add therapeutic carriage driving to the state event. This year, Equine Journeys was invited to do a lunch time demonstration of therapeutic carriage driving and received very favorable responses. They would like to put together a group of PATH Intl. centers that would like to initiate a petition drive to add this activity. If you have experience petitioning this organization or want to join the effort, contact Mario Pascarelli at (207) 353 402.